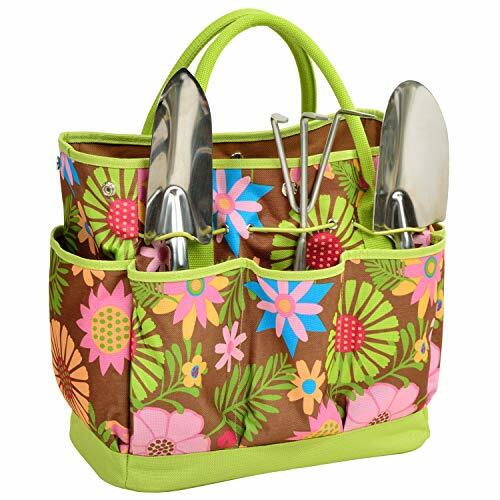 Stylish Gardening Tote with Tools includes a durable multi-pocket gardening tote and three top quality, heavy gauge stainless tools with comfort grip handles. The Roomy interior is fully lined in rugged 600D polycanvas and the tote has a rigid base with protective feet. The side pockets have room for a beverage and snack. It is perfect for transporting supplies while gardening. Designed and Assembled in the USA. Lifetime Warranty. Great gift idea for the avid gardener - attractive high quality multi-pocket garden tote with three heavy gauge stainless steel tools with comfort grip handles.